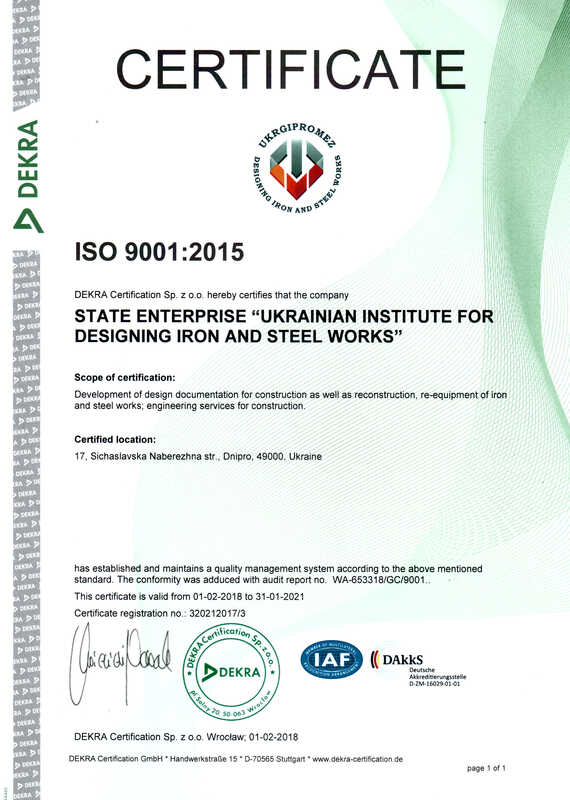 STATE OWNED UKRAINIAN INSTITUTE for DESIGNING IRON and STEEL WORKS is the leading design institute in Ukraine and one of the largest design institutes in CIS and non-CIS countries involved in comprehensive design and engineering of new steel projects as well as modernization and retrofitting of existing steel plants. Established in March, 1944 by resolution of the Government of the USSR, GP UKRGIPROMEZ took the lead in the process of post-war recovery of mining and metallurgical production facilities, construction of new plants in the country. During 70 years` history, apart from design and engineering for the plants in the USSR, the Institute executed works in India, North Korea, Vietnam, China, Egypt, Hungary, Poland, Serbia, Montenegro, Bulgaria, Czechia, Slovakia, Algeria, Nigeria, Iran, Syria and many other countries. Nowadays, geography of our works extends to plants and works in Republic of Kazakhstan, Russian Federation, India, Iran, Montenegro, in addition to the plants in Ukraine. The biggest value of GP Ukrgipromez is scientific and technological potential of our staff i.e. highly qualified experts of all specialties of mining and metallurgical production, the potential which was supported during a standstill in production sector, crises and challenging time nowadays. The Institute staff implements the latest technical and technological achievements in steel industry, introduces stateof-the-art equipment thus meeting requirements of the most demanding Clients. Besides mining and metallurgical projects, experts of the Institute are engaged in social projects. 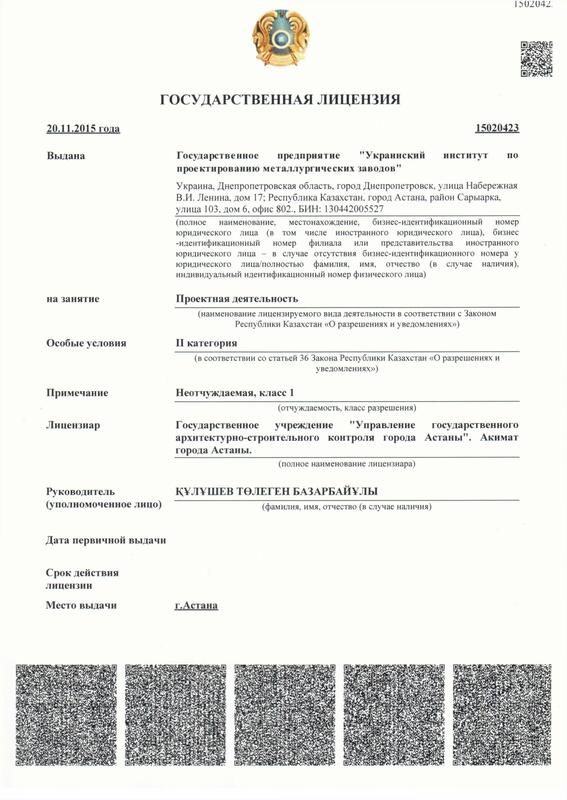 Nowadays in pursuance of instructions of Regional Public Administration and City Executive Committee the Institute experts are engaged in designing of apartment buildings in Pokrovskiy area of Dnepropetrovsk region, Fitness Club “Shturm” for children and teenagers, Fitness Complex “Mettal” in Dnepropetrovsk, Rehabilitation Centre for disabled people in Orlovshchina village of Dnepropetrovsk region, also in upgrading military hospital, schools and other public projects. The Church of the Icon of the Mother of God “Support of the Humble” in Yubileinyi village of Dnepropetrovsk region is under construction from design developed by GP Ukrgipromez. Seminars dedicated to advanced technologies in the field of design and engineering are regularly held at GP Ukrgipromez. 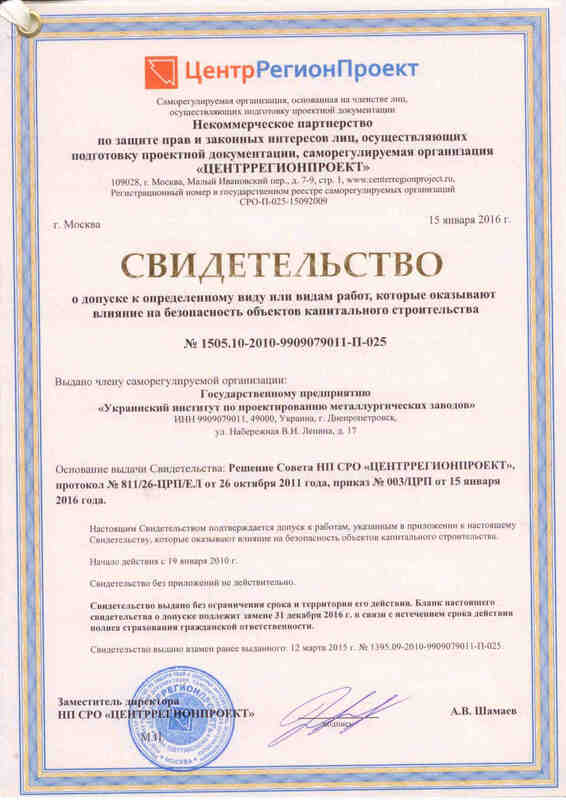 Results of the seminar show that GP Ukrgipromez steadily holds precedence in the field of state-of-the-art technologies, specifically in field of 3D designing, creation work using BIM models, geoinformational systems and technologies. The guiding principles of our work are: COMPETITIVE QUOTATIONS, HIGH QUALITI and the SHORTEST EXECUTION TIME. We are always open for close and fruitful cooperation!